Apple is set to report its earnings results for the third quarter of its 2017 fiscal year at 1:30 p.m. Pacific Time today. That guidance suggests Apple will report its second-best third quarter earnings results in the company's history. The quarter corresponds with April 1, 2017 through July 1, 2017. Wall Street's consensus is that Apple will report approximately $44.9 billion revenue and earnings per share of $1.57, according to dozens of estimates averaged by Thomson Reuters and Yahoo Finance. Apple is forecasted to have sold 40.7 million iPhones, 9 million iPads, and 4.3 million Macs, according to average estimates shared by Wells Fargo, compared to 40.4 million, 9.95 million, and 4.25 million respectively in the year-ago quarter. 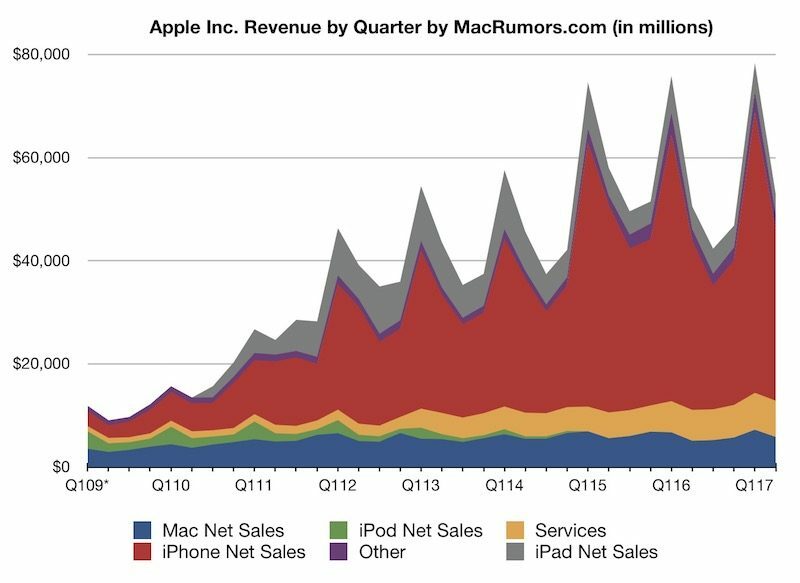 MacRumors.com compiled third quarter estimates from several financial institutions and analysts tracking Apple and the company's stock. 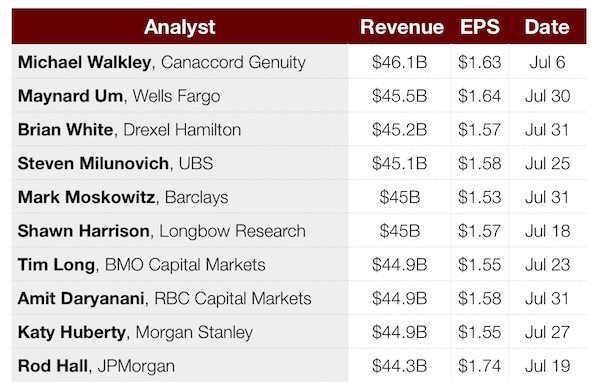 The figures are listed below, ranked from highest to lowest in quarterly revenue. All signs point to Apple reporting an above-average and generally unsurprising June quarter. The most interesting takeaway will be Apple's fourth quarter guidance and any clues that provides about the so-called iPhone 8. In addition to iPhone sales, investors will be looking for continued growth of Apple's services category, which includes the likes of the App Store, iTunes Store, Apple Music, Apple Pay, AppleCare, and licensing fees. Apple CEO Tim Cook and CFO Luca Maestri will discuss the company's financial results on a conference call at 2:00 p.m. Pacific Time. MacRumors.com will transcribe the call as it unfolds for those unable to listen. And again my stock continues to climb. Apple is not like Samsung. Samsung makes everything from warships to washing machines. If Apple ever failed in making a selling iPhone, their stock would sink like a ship hit by a torpedo. Apple is iPhone. Take away the iPhone and your stock TANKS! Apple IS currently a ONE HIT WONDER. Every other category is small, and flat or decreasing. So, you are correct...lackluster new MBP, lack of Mac Pro, etc., keeps those categories either flat or sinking. 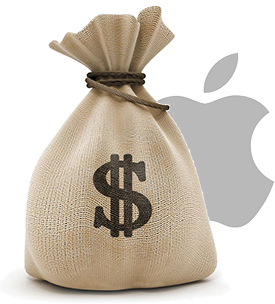 Apple makes most profit on iPhones compared to their other products. thats a lot of the business depending on a single product. Given all new redesign and bezel less OLED display this year, iPhone 8 Gonna break all previous record sales. Perhaps. I don't care about a redesign. I just wanted OLED but it appears we're getting it with conditions such as no touch ID. Guess we just have to wait and see what compromise Apple has in store for us. ...etc. Pure nonsense, in other words. Additionally, you're flat out wrong -- Apple's iPad revenue are larger than most other entire companies. Their services likewise. Etc.. But beyond this ignorance, it doesn't matter here in the land of reality because you can't take away the iPhone, it exists. iPhone dependance runs into crazy proportions. That's so risky. Whereas the man who said the PostPC-era had started - and assumed iPad would take over - appeared not to understand (how to drive) the market. That chart looks pretty flat since the start of FY 15. The only thing sustaining the limited revenue growth during that time is the increase in average selling price of the iPhone as more people get either the plus model or opt for larger storage. However, Apple will eventually run up against a ceiling where people won't keep piling on the options and will face increased competition from other vendors. Apple's outstanding growth has been in the perfection of markets for broad consumer adoption. It started in 2001 with the iPod, really hits its stride with the iPhone in 2007 which managed seven years of continuous market growth until the iPhone 6 in 2014, and was helped by the iPad in 2010 which had a few years of exponential growth before plateauing. Apple's problem now is the unit sales of their main products have been stagnant for three years and they don't have a revolutionary product on the horizon. This year's iPhone needs to have 20% or better unit sales growth to keep Apple as a leading tech company. If sales remain flat they will certainly continue to be successful but will face a transition to a commodity provider as opposed to the market leader they have been over the last 16 years. We are proud of you and all the people that own apple stock. We will continue to support you in every purchase we can! I bet Tim uses the word "Pipeline" in a sentence today.